function.These cranes should always be executed with a hoisting winch installation. 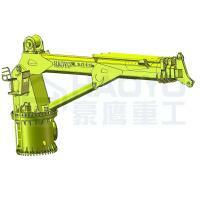 platform, hydraulic transmission parts, electric controlling part and etc. deck by high strength bolts. Connection mode must to be marked. oil cylinder controls goods correct hook-on point and landing point. ♦ check all the items and packaged well before loading. ♦ You can check loading or send picture to you. good perform in every detail. 2.Price:We have our own factory,so we can control the cost & delivery time.